Small design of a red poppy flower suitable for many crafts projects. 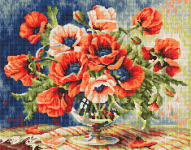 Wonderful design of a vase with poppy flowers in red and pink. Beautiful design inspired by a Snowdrop flower - one of the Spring symbols. Beautiful decorative rose pattern with the text: Where there is love there is life. Two peppers in warm yellow and green colors in front of a checkered background. Beautiful pattern of a bunch of grape with stem and leaves. 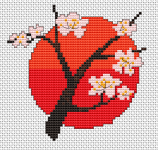 Beautiful pattern of a blossoming cherry tree with the bright red sun behind it. Abstract red flower on a dark background or black fabric. Beautiful pattern of a single Centaurea cyanus, commonly known as the cornflower. In some European cultures, the cornflower serves as a symbol of remembrance and sustenance. 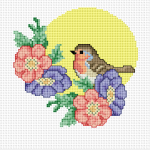 Colorful pattern of a cute robin with flowers.Complete and frame it to make a very special gift for birds lovers. 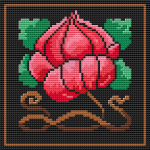 Beautiful cross stitch pattern of a blue iris flower.